Dhaka, 8 June, Abnews: Prime Minister Sheikh Hasina left Dhaka on Thursday evening on a four-day visit to Canada to attend the outreach session of G7 Summit at the invitation of her Canadian counterpart Justine Trudeau. An Emirates flight carrying the prime minister and her entourage members took off from Hazrat Shahjalal International Airport around 7:30pm. Industries Minister Amir Hossain Amu, Commerce Minister Tofail Ahmed, Road Transport and Bridges Minister Obaidul Quader, Civil Aviation and Tourism Minister AKM Shahjahan Kamal, Jatiya Sangsad Chief Whip ASM Feroz and State Minister for Foreign Affairs Md Shahriar Alam were present at the airport to see the premier off. Besides, Cabinet Secretary Mohammad Shafiul Alam, the chiefs of the three services, the dean of the diplomatic corps and high civil and military officials were present. 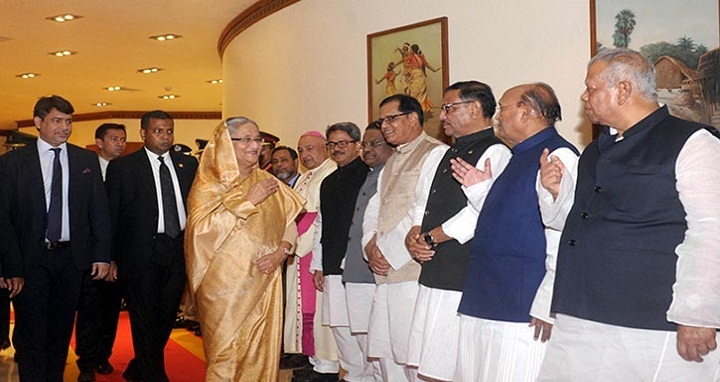 Sheikh Hasina is scheduled to reach Toronto via Dubai on Friday morning (local time). Bangladesh Consul General in Toronto Nayeem Uddin Ahmed and Director of International Relations of Canada and Deputy Chief of Protocol, Ontario Province Jonathan Sauve will receive the Prime Minister at Pearson International Airport in Toronto. After a two-hour stopover in Toronto, the premier will fly to provincial city Quebec, the venue of the outreach session of G7 Summit. Bangladesh High Commissioner to Canada Mizanur Rahman and Federal and Provincial Dignitaries of Canada will receive the Prime Minister at Jean Lesage International Airport upon her arrival in Quebec. In the evening, Sheikh Hasina will join a dinner to be hosted by Governor General of Canada in honour of heads of state and government taking part in the G7 Summit and outreach programme. The prime minister will join G7 Outreach Leaders Programme at Le Manoir Richelieu Hotel on Saturday. She will hold a meeting with Justine Trudeau on Sunday morning at her place of residence at Hotel Chateau Frontenac. From Quebec, Sheikh Hasina will return to Toronto on Sunday and exchange views with expatriate Bangladeshis at hotel Metro in the evening. On Monday, she will hold a meeting with Special Envoy of Canada on Myanmar Bob Rae at her hotel The Ritz Carlton where she will be staying. The premier will also have a meeting with Deputy Premier of Saskatchewan and Minister for Trade and Export Development Gordon Wyant Q.C. and Minister of Immigration and career Training of Saskatchewan Jeremy Harrison and business leaders of Saskatchewan Province. Before leaving Toronto, the prime minister will hold a meeting with President and CEO of Commercial Corporation of Canada (CCC) Martin Zablocki at her hotel. The premier will return home on Tuesday night via Dubai. Sheikh Hasina is joining the G7 Outreach Programme with 16 other world dignitaries beyond the Group of Seven (G7), a platform of world’s economic power houses. The G7 is a group consisting of the world’s seven largest advanced economies – Canada, France, Germany, Italy, Japan, the United Kingdom, and the United States.